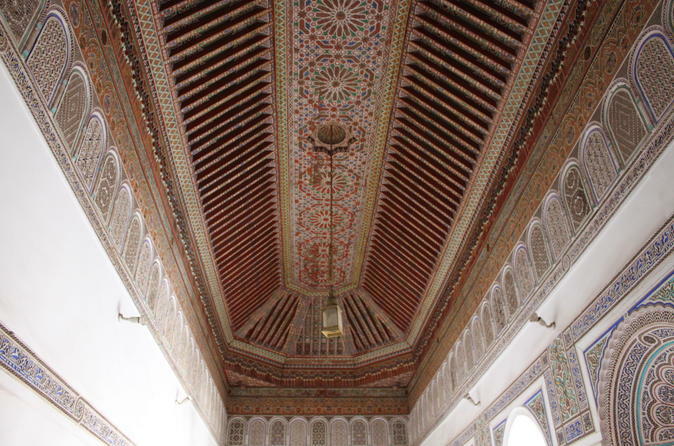 Discover some of Marrakech’s most beautiful buildings and hidden treasures on this morning tour. With a local guide, admire top Marrakech attractions including the Koutoubia Mosque with its sublime minaret; and the pavilions, courtyards and perfumed gardens of the Bahia Palace. Hear historical anecdotes from your guide as you explore, and round off your tour with visits to the decorative Saadian Tombs and Tiskiwin Museum, home to a fascinating exhibition on the ancient Saharan caravan routes between Marrakech and Timbuktu. Inizia il tuo tour con un pick-up in hotel o nel centro di Marrakech. 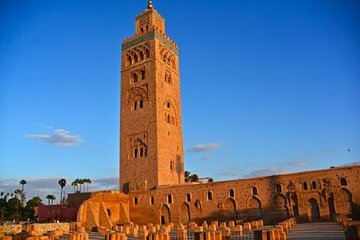 Quindi, parti alla scoperta di alcuni dei palazzi e dei monumenti più importanti di Marrakech, oltre ad alcuni tesori meno noti. Dirigetevi verso la Moschea Koutoubia, la più grande moschea del Marocco e una delle più grandi al mondo. Ammirate l'esterno ispano-moresco, risalente al XII secolo, mentre la vostra guida racconta la sua storia e ammirate il fulcro: il minareto da 253 piedi (70 metri), sormontato da una guglia e sfere. Prosegui per il Palazzo Bahia, una residenza dei sultani del XIX secolo. Costruito per eclissare tutti gli altri palazzi, questo delizioso complesso comprende padiglioni decorati, giardini e un harem. Passeggia per le sale ricoperte di mosaici e i cortili profumati mentre la tua guida condivide i racconti dei sultani che vivevano qui. Successivamente, visita le Tombe Saadiane, una serie di camere di sepoltura reali risalenti al 1500. Ammira le camere di marmo e le camere a cupola di cedro e scopri come furono rinvenute le tombe nel 1917. Infine, visita il Museo Tiskiwin, un doppio riad (tradizionale casa del cortile) con un'esposizione che copre le antiche rotte commerciali sahariane tra Marrakech e Timbuktu. Guarda le arti e mestieri in mostra, inclusi abiti berbere, gioielli e tappeti, e poi termina il tour al punto di partenza originale. The guide's English was a little difficult to understand, went on a little bit too much on certain historical aspects. The sights were good didn't need the herbalist shop visit towards the end. The tour proceeded in a downpour. No consideration was given to reschedule as you could not leave the taxi. Complete waste of time. This tour was not the best, but good enough to get you familiar with the area to later go sightseeing on your own. I felt the tour guide didn't give a lot of information and didn't see a whole lot. However it was just ok to me. Great tour, lovely efficient guide. Monuments were beautiful and the history fully explained. There was a bit of walking which was great as it took you through non touristic parts outside the medina wall. We stopped at a cake shop to sample some of the local cakes. Also stopped for lunch at a designated restaurant which had a mixture of tourist and locals there. The food was actually some of the best I had in Morocco and you were able to enjoy wine with your meal which is rare in the medinas in Morocco. The pace of the tour was quite relaxed and the length perfect. Also one person was not picked up due to a mix up and the tour guide changed the schedule slightly to allow her to join the tour pretty much from the start which I thought was excellent service. Superb Abdul was very attentive to us all spoke 4 foreign languages. We visited many of the key sites and he was a wealth of information. Cannot wait for my next tour this afternoon which if yesterday,s tour is anything to go by will be equally enjoyable. Very nice! Our tour guide was fun and knowledgeable. His English was clear and I was happy he showed us some shops where my mother, sisters and I were able to get some natural products for the hair and skin. Great tour with a very friendly and informative guide, took us to the major sites in and around Marrakech. Would highly recommend as a great introduction to Marrakech. Guide was lovely and spoke in several languages, definitely knew his stuff as well. Learnt a lot and saw some beautiful places, would highly recommend!